The complete silent version of Ben-Hur from 1925 is available as a DVD extra on some 3 and 4 disc editions of the more famous William Wyler version from 1959, and it's well worth paying a bit extra for. At over two hours, the film is rather long for a silent film (even more than with subtitled films, you can't take your eyes off the screen, as there's not so much as a sound effect to tell you what's going on - which makes this seem rather long when you're thinking about that pile of work you've got to do and how much you want your dinner!). However, it's beautifully shot and produced and Ramon Novarro is engaging and likeable in the lead role. Like the 1959 version, this film opens (after the obligatory title card about how eeeevil pagan Romans were eventually defeated by Christians) with a long nativity sequence that tells the entire Christmas narrative, complete with wise men on camels (yay! camels!) and Bible quotations. Mary seems to have a magical ability to hypnotise people into liking her, which just makes her look creepy to me, and after the baby is born she gains a massive golden halo that looks even creepier. The wise men are said to be Greek, Hindu and Egyptian, which is totally off - according to Matthew, they were Persian priests, so they should all be Persian (modern Iranian). It's rather nicely done though. If I were watching a Jesus film, I'd have been totally engaged, but I have to admit I wondered when we were going to get to Ben-Hur. Still, it is subtitled 'A Tale of the Christ' after all. The use of colour is this film is fascinating. Sometimes the film is tinted to give an impression of the surroundings - yellow for the desert, purple or blue for night-time or a prison cell, and so on. Then certain scenes are presented in full colour - the nativity scene at the manger, scenes set in Rome, including a triumphal entrance (complete with girls in bikinis for some reason) and scenes concerning Jesus' ministry, like the sermon on the mount, the entrance into Jerusalem and so on. The colour is gorgeous and the changing colours are quite effective. They take you out of the film a bit, more so than if you were just watching in black and white (which you get used to after a while). As Mark Kermode would put it, they are a Brechtian alienating device. But they're quite effective and they keep the long film feeling fresh. Ben-Hur and Messala. Yes, all his skirts are that short. The inaccuracies in the film as a whole are too numerous to discuss at length - inappropriate use of the word 'tyrant' (which had a very specific meaning in the ancient world), a 'bond-slave' who for some reason can't be freed (nonsense - ancient slavery was chattel slavery, not bond-slavery, and you could free people whenever you wanted), Celts from Britain marching in the Roman army more than a decade before the conquest of Britain, and so on, and so forth. I rather like the old tradition of not showing the face of Jesus on film, but it could be better done here - his hand keeps appearing from the side of the screen, wobbling slightly, presumably because the actor is standing at an awkward angle, and the whole thing looks more like a really cheap puppet show than anything else. The one-armed carpentry work looks particularly awkward, but I think the award for Silliest Way of Hiding the Face of Jesus goes to the random disciple sitting in right front of him at the Da Vinci-style Last Supper. The conflict in this version of the story is almost enitrely racial, between massively anti-Semitic Romans and victimised Jews. This is true of all versions of the story to an extent of course, but the 1959 version incorporates more elements of the fractured personal relationship between Ben-Hur and Messala and doesn't shove the glory of ancient Israel and nasty anti-Semitism of the eeeeevil Romans in your face quite so much. Or maybe it's just been too long since I watched it. Anyway, Messala here looks downright creepy in some scenes, though that may just be something to do with the film's quality. He's very two-dimensional figure - Stephen Boyd's performance in the 1959 version was rather more nuanced, but Francis Bushman plays the straightforward villain for the most part. His death is also rather less tragic - Ben-Hur doesn't seem terribly fussed about what happens to him. We see him pulled from the wreckage of his chariot with a bit of blood on his face, and that's it. 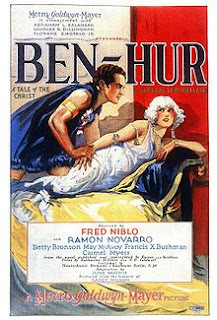 Esther and Ben-Hur are also unbearably twee. There's a whole business with a pigeon (rats with wings, seriously!) and Esther has the most improbably blond curls falling all over her face. Give me Metropolis' simple but effective heart-clutching to show romantic affection any day. This version of the story has Esther willingly declare herself to be quite literally Ben-Hur's slave, which I suppose is supposed to be romantic (I, again, found it creepy. It's a good thing I didn't live in the 1920s, I would have spent the entire decade in a perpetual state of freaked-out-ness). Esther. No offence to the actress, but urgh. I was quite surprised by some of the gore and violence, tempered by being in black and white but still pretty harsh. There's a naked slave strung up on the ship (why would you waste space on a ship stringing up slaves naked? Never mind), there are severed heads on sticks, a Roman prisoner strapped on to the front of the pirates' ship and rammed into a Roman galley and people groaning and still alive while spiked on a spear. This film pre-dates the finalising of the Hays Code in 1930, and clearly the filmmakers are not shy of showing it like it is. 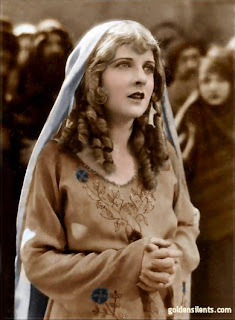 The film features a character called Iras the Egyptian. The name, a quick scan of the novel (available on Google Books) reveals, belongs to a character in the book, but the character in the film is completely different. Book!Iras was Balthazar (a Wise Man)'s daughter, but Film!Iras is a rather thin Cleopatra clone. In the tradition of the 1920s vamp, she's an evil seductress who tries to lure Ben-Hur into revealing his identity to her before the race, a dangerous sexual presence in direct contrast to the oh-so-innocent Esther. Her presence and attachment to Messala, whom we've almost forgotten about by the time he reappears for the chariot race, seems to be little more than an excuse to break out the Cleopatra cosutmes and have her vamp it up. There's some great stuff in this film though. 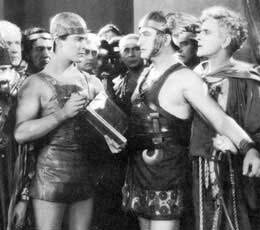 Ramon Novarro is very good in the title role and has very nice legs, which the costume department seem determined to show off at every available opportunity. The scene where Ben-Hur's mother and sister watch him sleeping but can't touch him because they have leprosy is very moving (though if someone started stroking my shoe while it was on my foot, I'd wake up). The chariot race is brilliant, impressive and exciting to watch. I was particularly pleased to see Messala cheating by forcing another driver to crash in front of Ben-Hur and by whipping Ben-Hur himself, but without at any point resorting to over-the-top or cartoonish means like putting blades on his chariot wheels. I always expect to see Popeye and Bluto turn up when that happens in the 1959 film. Novarro's legs again. And quite a lot of the rest of him, in fact. I would definitely encourage everyone with an interest in film or in ancient world films to seek out this one. Although it's long, it's fascinating to watch and some of the big crowd scenes look really impressive. It's also something of a glimpse into a lost world - like Metropolis or Nosferatu (both brilliant) it's a glimpse into how people in the 1920s imagined a different world, which is in some ways even more interesting than more contemporary '20s stories. From what you say, the character of Iras does not sound so different from the book's - she is both the daughter of Balthazar and a seductress who completes a love triangle with Esther and Ben-Hur (or a square, since IIRC she also has something going on with Messala). The idea of the three wise men being Greek, Egyptian and Indian is also from the book, which has a long scene at the beginning of each of them explaining his culture and background to the other two. Ah, that explains it. Still mostly used as an excuse to break out the Cleopatra costumes tho! Re the three kings: There's a fairly old tradition dating back to at least the early Middle Ages that they represented the three continents of the known world. One European, one Asian and one African. I'm not sure where it comes from, but then the tradition that there were three of them is extra-biblical too. It probably started with the three gifts mentioned - gold, frankincense and myrrh - and oversymbolized from there. It's sometimes astonishing to realize how fully realized and mature film was in the silent era. Through cultural osmosis we come to expect nothing better than the Keystone Kops and cheesey westerns, or at best Charlie Chaplin and Buster Keaton. There was some terrific, even experimental stuff going on. Some of the acting tends to be overplayed (like Esther here), but part of that is the style of the time and part of it is trying to directly use stage acting where every gesture needs to be seen in the back row.